Nd:YLF: 1053, 527, 351nm; 1047, 524, 349nm. 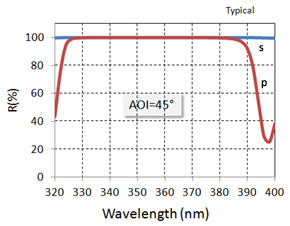 Angle of incidence (AOI): 45o or 0o with a large angular acceptance. Substrate material: BK7 or UVFS glass, Dia 0.5", 1" or 2", Thickness 6.0mm. Other coating traces are available upon request. Dust and stains on mirror surfaces can cause scattering/loss of light and can even react with light to damage the surfaces at a high incident laser power. You can inspect the mirror surface for dust and stains by holding it near a bright visible-light source. Viewing at different angles helps to see scattering from dust and stains. The mirror surface has to be cleaned if dust and stains are found. A canister of compressed N2/clean air or a blower bulb (http://www.adorama.com/GTRABS.html ) should be first used to blow off dust and other loose contaminants. If a dry nitrogen line is available in the lab, an air gun can also be used to blow away dust particles. Blow off the surface gently. Do not blow off the mirror itself from your hand ! Hold the mirror so that the surface is horizontal and slightly above your fingers. Take a fresh, clean sheet of lens tissue and place it on the surface. Make sure the lens tissue can be drawn across the mirror surface. Next place a small drop of pure isopropyl alcohol (IPA) on the lens tissue on top of the mirror surface. 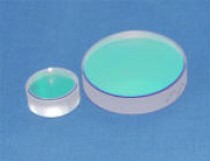 The weight of the solvent will cause the lens tissue to come into contact with the mirror surface. Slowly but steadily drag the damp lens tissue across the mirror surface being careful not to lift the lens tissue off of the surface. Continue dragging the lens tissue until it is off of the surface. The amount of the solvent can be adjusted for various mirror size so the lens tissue is kept damp for the entire drag but there is not any visible trace of solvent on the mirror surface after the drag is finished. Inspect the surface and repeat if necessary, but only use each sheet of lens tissue once.